Former kolkata knight rider captain Saurov Ganguly has been signed by Pune Warriors, the team at bottom of the table to play in IPL season 4. King of off-side Sourav Ganguly is now also the king of comebacks. For close to 20 years - since his India debut in 1992 - the former Indian skipper has bounced back every time he has been written off. Three months ago, he went unsold during the auction for the IPL where his base price was $400,000. He returned to IPL as a Pune Warrior, replacing injured Ashish Nehra. Sahara Pune Warriors, who debuted with Kochi Tuskers this season, are struggling, having lost six matches in a row. Saying Ganguly, who joined the squad after flying in from Kolkata, will not play the crunch game against Mumbai Indians on Wednesday, skipper Yuvraj Singh hoped his former captain's "experience" would come handy. 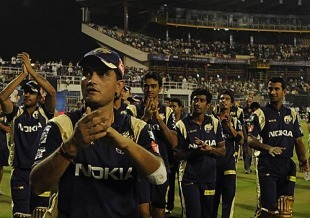 Sahara India Group's director of communication Abhijit Sarkar did say Ganguly had a "point to prove" and if he does that, Warriors will be back in business.